Despite its size and intense pace, New York City is an amazing place to explore with the whole family. Choosing a great place to stay is important because of the amenities as well as the location. If you are traveling with younger kids, pick a hotel that's close Central Park where you'll have easy access to twenty playgrounds, a zoo and other fun things to do. If you plan to go see a Broadway show with an older child, look for a hotel within easy walking distance of New York's Times Square so that you don't have to worry about waiting for a cab or subway after the show. If you are interested in shopping and downtown attractions, there are many amazing hotels in lower Manhattan. 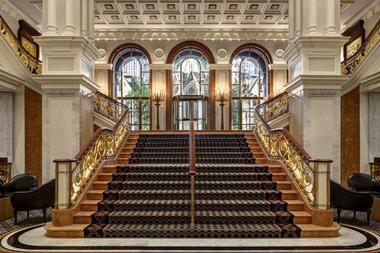 The New York Palace feels just like its name implies – a grand, modern-day palace. If you are traveling with a little girl who wants to be a princess, check into this unique hotel in the heart of Midtown Manhattan. You will be steps away from New York City’s best shops and attractions. The hotel recently completed a $140-million renovation project and offers 909 rooms and suites. 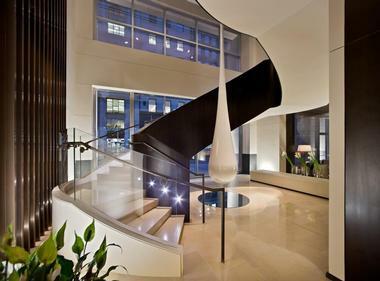 The stunning 5,000-square-foot Champagne Suite is spread across three floors and connected by winding marble staircases. The Champagne Suite offers a breathtaking view of St. Patrick’s Cathedral and features a 10-seat formal dining room, a fully stocked wine cave and a 29-foot-wide mural by French artists Alex et Marine. The New York Palace Spa provides massage therapies, facials, body treatments and in-room services. Midtown East gym has large windows with a view, steam rooms, top-of-the-line equipment, and complimentary exercise clothing. Pomme Palace is a French cafe that serves everything from macaroons and miniature fruit tarts to 72-hour braised short rib sandwiches and French onion soup. Trouble’s Trust is a cocktail bar with a modern design. Tavern on 51 was inspired by old New York and has period details such as stained glass windows. More ideas: 25 Best Things To Do in Brooklyn, NY. Families get to choose from several types of room and suite layouts at the Viceroy New York, many with Central Park views. The hotel is located on West 57th Street between 6th and 7th Avenues. You will enter through a stunning double-height lobby before heading to your stylish guest room. The hotel has two restaurants: Kingside Restaurant serves New American cuisine and the Roof features a stylish outdoor terrace with panoramic views. The hotel has a 24-hour fitness center and free internet. Rooms start at $450 (855–647–1619). 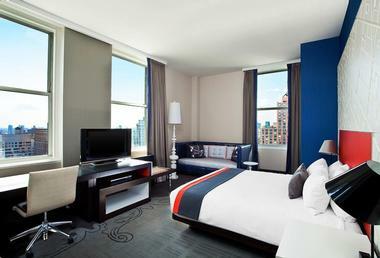 Loews Regency New York is located right next to the best shopping, sightseeing and famous museums. Signature amenities include Frette sheets, high-speed internet and an ergonomic desk chair if have to do some work while on your family vacation. Work out at the Fitness Center with sauna, personal trainers, massage therapists and Pilates instructors. Julien Farel Restore Salon & Spa is a 10,000-square-foot oasis with floor-to-ceiling windows, a plush lounge and a diverse menu of services. The Regency Bar & Grill serves new American cuisine for breakfast, lunch and dinner. Sant Ambroeus Coffee Bar offers quick snacks and great coffee (800-233-2356) . The 70 park avenue offers 205 luxury rooms with 42" flat screen high definition TVs, CD/DVD players and Soundmatters MAINstage sound system. Guests receive complimentary WiFi high speed Internet access throughout the hotel. The 30 connecting rooms make it a good choice for a family vacation in the city. The hotel is pet friendly. Silverleaf Coffee & Tea serves coffees, pastries and snacks from 6:30 am - 11:30 am. Silverleaf Tavern serves cocktails every day except Sundays. Fifth Avenue shopping, Union Square, Bryant Park, the United Nations, the Rockefeller Center, Broadway, museums and nightlife are within easy walking distance of the hotel. Rates start at $238 per night (877-707-2752). Grand Hyatt New York is located in Midtown Manhattan, near Times Square, Broadway theaters, the Rockefeller Center and Fifth Avenue shopping. The hotel has a beautiful lobby with high ceilings, plush sitting areas and a water feature. 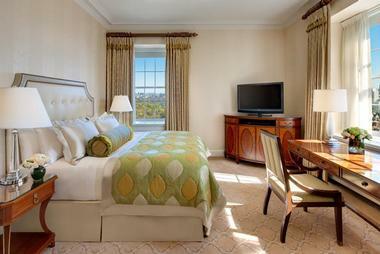 There are 1,311 renovated guest rooms and suites, many with scenic city views. If you are visiting the city on business, the hotel guest rooms have work desks and high-speed internet access. There is also a full-service 24-hour Business Center and 24-hour room service. Stay fit on your getaway by working out in the 24-hour gym, or do yoga. Rooms rates start at $260 per night (212 883 1234). 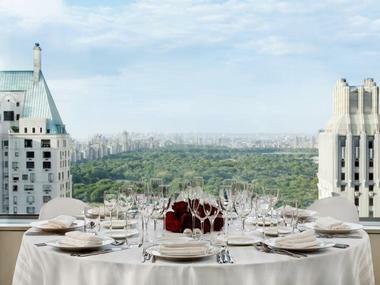 Located on Central Park South, Park Lane Hotel is a 46-story hotel offering spectacular Central Park views. Guest rooms and hotel common areas are decorated in grand European style and have large windows through which you can enjoy the view. Because of its location, all the hotel has to do is keep its windows clean. It does that and a lot more. The recently renovated executive level, located on floors 25 through 46, offers vacationers additional luxury amenities. Take advantage of the concierge staff to get reservations at exclusive restaurants, spas and shops. Ask for help with last minute tickets for performances at the nearby Lincoln Center and Carnegie Hall. The restaurant serves lunch, dinner, Sunday brunch and many holiday celebrations. Harry's bar and lounge is a popular hangout for New Yorkers and visitors alike. The hotel has a fitness center, garage, and accepts dogs under 20 pounds. Rooms start from $455 per night. The hotel allows you to check in with a dog under 20 pounds (212-371-4000). 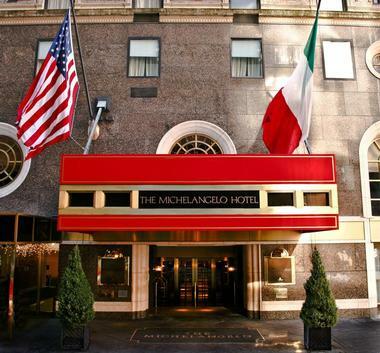 The Michelangelo Hotel is ideally located near Broadway theaters. In addition, the hotel offers some of the largest rooms in the city. Guests receive complimentary coffee and tea served Italian Style in the Lobby Lounge. Other conveniences include a turndown service, multi-lingual concierge staff, 24-hour fitness center and 24-hour room service. There are 178 rooms and suites decorated in three distinct styles: art deco, country French and neoclassical. Guest rooms average 475 square feet in size and feature marble foyers, sitting areas, king size beds and two television sets. Guest bathrooms have bidets and large bathtubs - you can take a relaxing bath as soon as you check in. The hotel restaurant Insieme serves Italian dishes with a contemporary twist. The Lobby Lounge offers a variety of drinks. VacationIdea.com Vacation Tip: Check in during the holidays and take the kids to see the amazing Christmas tree at the Rockefeller Center. Room rates start at $395 per night (800-237-0990). The Lowell is located on the fashionable Upper East Side, a block from Central Park, Madison Avenue shopping and great restaurants. Take a walk in the park, see a Broadway show and visit famous museums. Guest rooms feature marble bathrooms, full service kitchens, 3 telephones and complimentary wireless high-speed internet access. Rooms measure about 400 square feet in size. Room rates start at $575 per night (212.838.1400). Union Square is a vibrant neighborhood featuring the the world-famous Greenmarket, a historic park, great restaurants, shops and entertainment options. Hyatt Union Square New York is perfectly positioned to give you access to everything the area has to offer. Designed by the renowned interior designer Paul Vega, the hotel's interiors reflect urban design with natural touches. The building has a historic facade and a 23-foot high ceiling which welcome the visitor into this unique space. The hotel has 178 modern rooms and suites with plush Grand Bed. Each room has a 37-inch flat screen TV & Geneva Sound System, iPad Check-In, complimentary Wi-Fi access in all public areas and a 24 hour StayFit gym. Dining options the whole family can enjoy include The Fourth: All-day American Brasserie and SingL Lounge. If you are planning a special event, you can rent one of the rooms with private landscaped terraces. Room rates start at $459 per night (212-253-1234). 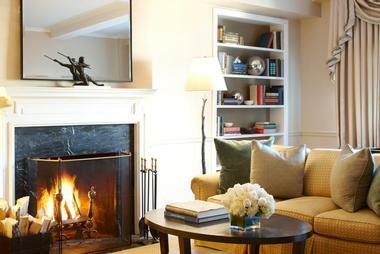 Le Parker Meridien is located on West 57th Street, near Central Park and many great shops. Guests can choose from a collection of suites with full kitchen, perfect for longer stays and family travelers. The suites have separate sitting areas, as well as cedar-lined baths and showers that can easily accommodate two. 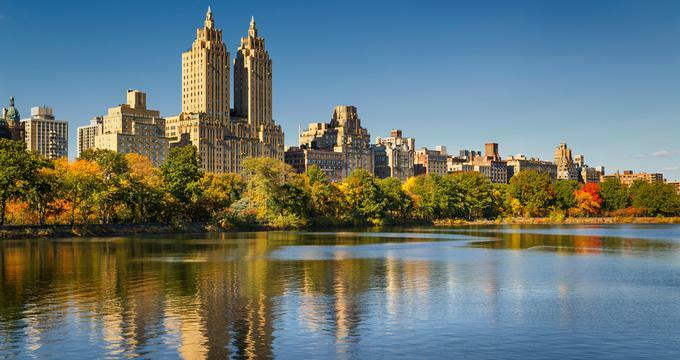 Whether you are in Big Apple on business or pleasure, you will enjoy exploring the gardens and lakes of Central Park. Take a meditative walk through the lush trees, past an ice skating rink and over romantic bridges. There are always sounds of nature to accompany you on your walk, including birds and squirrels. Stay fit on the road at the hotel's gym and swim in the indoor pool with spectacular park views. Enjoy gourmet dining at Norma's and Knave restaurants. Rooms start from $439 per night (212-245-5000). 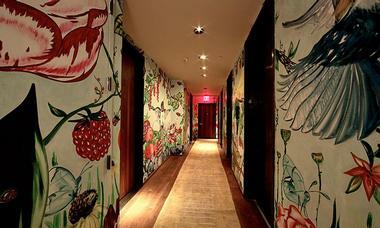 The Chambers Hotel is a luxury New York boutique hotel next to Manhattan's 5th Avenue at 56th Street. You'll be close to some of the city's best shopping, dining and entertainment venues. There are 72 romantic boutique guestrooms and 5 suites, two with terraces. Rooms feature high ceilings and Turkish rugs which create a loft-like ambiance. Town restaurant and bar serves contemporary cuisine. The space has an intimate balcony with low tables and settees, perfect for conversation. Personal yoga instruction, in-room massageand free passes to the New York Sports Club are available to hotel guests. The hotel is located on West 56th Street, between 5th and 6th Avenues. Room start at $395 per night (212-974-5656). Just one subway stop from Manhattan, the newly opened Wythe Hotel is a great place to stay if you want to enjoy scenic views of the Manhattan skyline and explore the boutiques, galleries and restaurants in the Williamsburg neighborhood of Brooklyn. There are 72 guest rooms on 8 stories, as well as four lofts, two of which have private roof decks. 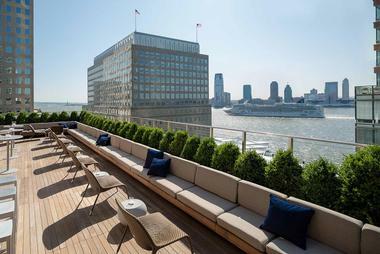 The 6th floor rooftop bar and terrace Ides overlooks Manhattan and Brooklyn. Reynard on the ground floor serves American fare and seasonal cocktails. The hotel also has a 60-seat screening room. 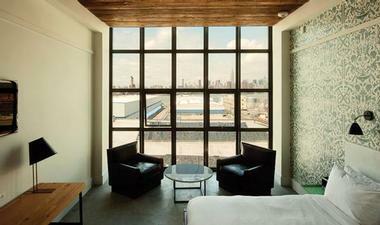 Ask for one of the rooms with floor-to-ceiling windows facing Manhattan to get the best view. The hotel is housed in a building that dates back to 1901. The restoration preserved many historic features, including 13 foot high original timber ceilings, arched windows and cast-iron columns. Guest accommodations feature radiant heat concrete floors, custom amenities and works by local artists. The Pierre is a landmark hotel is located right next to Central Park. Book a room with a view of the park and enjoy easy access to some of the city's most famous attractions. 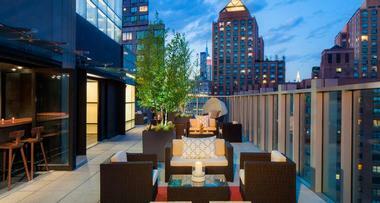 The Pierre is popular with couples and honeymooners who want to stay at a premier address in Manhattan. You will be close to the shops on Madison Avenue and the museums such as the Met, Guggenheim, Whitney and the Frick. 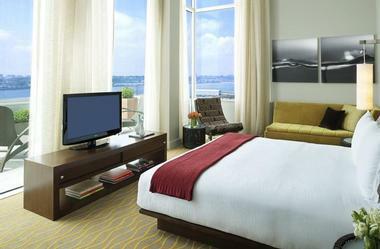 The hotel completed a meticulous $100 million renovation with new guestroom and bath interiors. 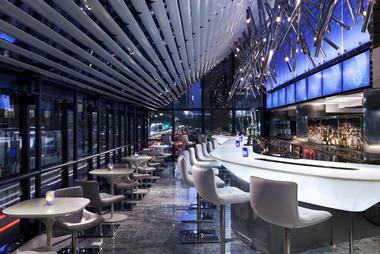 The first floor public areas were reconfigured to accommodate a new restaurant and lobby lounge. Jiva Spa draws its inspiration from ancient Indian healing techniques, letting vacationers choose from a diverse menu of rejuvenating holistic treatments. Treat your body and mind with these pampering spa techniques at this amazing spa. Room rates at the Pierre start at $795 (212-838-8000). 60 Thompson is located between Spring and Broome streets in Manhattan's Soho district. You'll be close to stylish shops and restaurants in the area. There are 100 guest rooms and suites, including a duplex penthouse loft with a private garden deck. Guest rooms feature Frette linens and robes, pure down bedding, DVD and CD players, and pantries stocked with gourmet items from Dean & DeLuca gourmet food shop. Kittichai is an authentic gourmet Thai restaurant. There is also a lounge and bar located on the second floor and a members only rooftop bar named A 60. The hotel's location makes it easily reachable by car or subway. Rates start at around $325 for a superior room with a queen bed (877-431-0400). Casablanca Hotel features unique Moroccan decor and central location in New York's Times Square. The hotel is near the city's hottest attractions, shows and restaurants. Rick's Cafe on the second floor offers a relaxing setting, complete with a fireplace, classical music, TV and books. Free breakfast is served in the morning, while wine & cheese are offered each weekday evening. For lunch, head to Tony's di Napoli Restaurant which serves family-style Italian cuisine. There are 48 luxury rooms and suites, decorated with unique tapestries, paintings and ornamental moldings. The rooms are soundproof so that you can get a good night's sleep right in the heart of Times Square. Stay fit while you travel by working out at the New York Sports Club which has a pool, sauna, weights and exercise machines (the hotel will give you a free pass). Room rates start at $278 per night, including breakfast, wine & cheese reception and free Wi-Fi. Ask about "The American Museum of Natural History Package" or "Here's Looking at You, Kid!" specials for families (212-869-1212). Named after the neighborhood it's located in, NoMad (North of Madison Square Park) is a hotel inspired by the classic grand hotels of Europe with a NY twist. The hotel has 168 guest rooms and suites with a residential feel, featuring custom furnishings and original artwork. The freestanding clawfoot bathtubs add a romantic touch to the bathrooms. In the bedrooms, you will find handmade vintage Heriz rugs, Portraits De Villes photographs and modern amenities such as iHome docking stations and large flat screen LCD HD televisions. If you are planning a honeymoon, book the Suite Royale which measures 1,100 square feet and has a 700 square foot private terrace. There are several dining options available at the hotel, including the sunlit Atrium with a pyramidal glass roof, the Dining Room with dark oak furnishings and the Fireplace offering signature family-style meals. The library serves light fare during the day and cocktails at night. 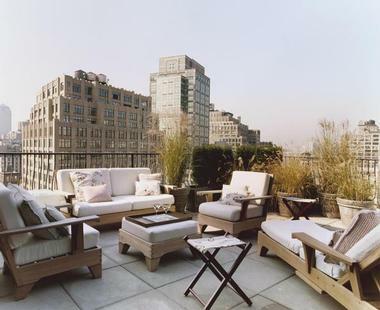 The Rooftop includes a bar and restaurant with a five-course tasting menu by Chef Daniel Humm. The hotel is located at 28th Street and Broadway in Manhattan. Langham Place, Fifth Avenue is a landmark hotel located on Fifth Avenue in New York City. Towering 60 stories into the sky, this hotel represents style and sophistication. Signature services make a stay at the Langham a great experience, even for the most veteran travelers. The property enjoys a worldwide reputation for impeccable service, attracting both business and leisure travelers. There are 214 rooms and suites. Many of the rooms are very spacious, giving your the experience of a small private apartment. 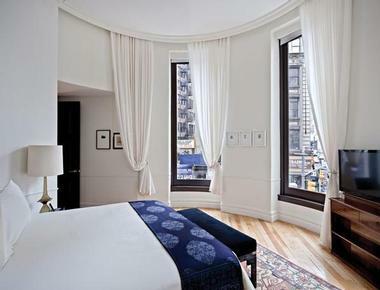 Inside the rooms, you will find Pratesi linens, Duxiana beds, artwork and full-length windows with city views. Hand-selected Rosewood, Walnut and Calacatta Marble is used in the bathrooms. Ai Fiori is an elegant restaurant serving Mediterranean, European and world cuisines. Measure bar and lounge has both British and American decor accents. The drink menu includes classic cocktails, new and old world wines, and the best beers you can find in NYC. The cocktails are from a world famous mixologist. Measure lounge serves breakfast the morning and live jazz too in the evenings. The spa has 11 private spa rooms, including couples' treatment rooms. Stone vanities, limestone and black oak floors make the ambiance just perfect for a relaxing afternoon. Guests get to choose from many organic and natural treatments. Room rates start at USD $695 per night (212-695 4005). Located in lower Manhattan on the crossroads of business and leisure, Conrad New York is an all-suite getaway with spectacular views of the Hudson River. There is a virtual concierge which lets you make requests using a television, laptop, touch pad or smartphone. Whether you need to make dining reservations, order room service or extra pillows, you can do so with a touch of a button. There are 463 oversized guest suites with separate living and sleeping areas. The luxury suites have two flat-screen TVs, espresso machines and Wi-Fi access. Ask for one of the Superior River View Suites which are located on the the highest floors and offer some of the best river views. The luxury suites feature light wood decor, contemporary artwork throughout the suite, rainfall shower, Aromatherapy Associates toiletries and plush bathrobes and slippers. ATRIO Wine Bar & Restaurant serves a selection of delicious entrees. The Loopy Doopy Rooftop Bar is open during the warmer season and offers spectacular views of the Hudson River and Lower Manhattan. The bar offers a wide selection of beer, wines and small dishes, as well as innovative cocktails, such as the infamous "Boozy Icepop" served in a glass of Prosecco. 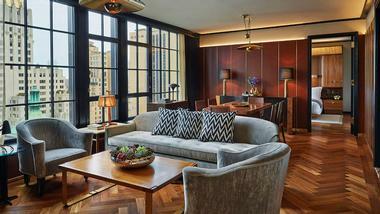 Suites start at $509 per night (212.945.0100). Ink48 is located in Midtown Manhattan, offering spectacular city and Hudson River views. Inside, guests find stylish, welcoming interiors and attantive service. The building was once a printing house and is located at the corners of 11th Avenue and West 48th Street, just a block away from the river, Times Square, Javits Center and the Manhattan Cruise Terminal. You will be within close to first-rate shopping, Broadway theaters, Central Park gardens and museums. The hotel's 222 guestrooms and suites are inspired by contemporary loft design. This is a Kimpton-brand Hotel, which means that guests have access to pet-friendly amenities and other luxury services. Print restaurant serves dishes made from fresh regional farm produce in a rooftop setting. The distinguished Press Lounge NYC comes with a glass-enclosed rooftop bar on the 16th floor of the hotel, offering various cocktails and a menu of light dishes with sweeping views of the river and the Manhattan skyline. InkSpa, located on the second floor, has a Zen garden, a Swiss shower area, a private treatment quarter and a couple's treatment room. The in-house fitness center is available 24/7 for strength exercises, body workouts and yoga that will keep you fit and trim throughout your stay. Take advantage of the complimentary bicycle program and explore Manhattan by bike. The hotel offers versatile indoor and outdoor event spaces which are ideal for weddings, conferences and other events. The Press Lounge can accommodate up to 300 guests and has great views of Hudson River and Manhattan. Room rates start at USD $269 per night (212-757-0088). W New York - Union Square is located at Park Avenue and 17th Street in Silicon Alley, New York City. The hotel is situated in the restored 20-story Guardian Life Building, a granite and limestone landmark building. If you are looking for unique trip ideas, try this stylish getaway in NYC. Nearby, guests can explore the famous Union Square Farmer's Market and splurge at boutique shops on Fifth and Sixth Avenues. The is located at the northeast corner of Union Square Park, near many fine restaurants, bars, and theaters. Following the W Hotels credo "Whatever, Whenever," the hotel provides a 24-hour concierge service ready to fulfill even the most unusual requests. 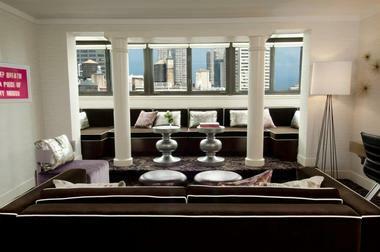 The hotel features the 3,000-square-foot Underbar, one of Manhattan's nightlife hot-spots. The bar offers private "niches" with curtains which provide anonymity, great for couples. There are 270 guest rooms, including 15 suites, with custom designed furniture with a whimsical touch such as an overstuffed velvet armchair, or a purple blanket. Guest rooms have a down feather bed with custom pillow-topped mattress, custom formulated Aveda bath products, bathrobes, and Turkish towels by Portico. Olives restaurant, created by the famed Chef Todd English, has a rustic feel with its wood ovens and open wood fires. It serves Italian and Mediterranean cuisine with American interpretation, using the fresh produce from the Union Square Farmer's Market. The restaurant has wood floors, oriental carpets, and stunning park views. 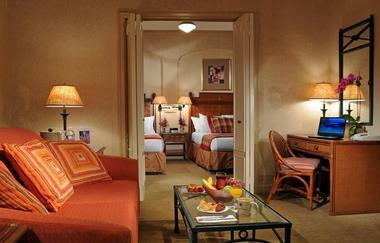 The price for a double room starts at about USD $349 per night (212-253-9119, 877-W-HOTELS). See more great weekend trips: from NYC, Boston, Vermont and the Finger Lakes. Stay in a hotel next to Central Park which will give you quick and easy access to playgrounds, ponds, lakes, the zoo and many other fun spots to visit with kids. Central Park is home to attractions that kids cannot see anywhere else. From the favorite Alice in Wonderland Statue, to the Marionette Theater and the Park's 21 playgrounds, every child will be entertained. Best of all, most of the attractions in the park are free. While the area is very popular on weekends, it is quite empty during the week which makes it a great escape for the whole family. Older kids may like to visit the Great Lawn to watch a variety of sports on weekends. In the summer you can rent a boat at the Boathouse and enjoy spectacular views of the city. The 21 Central Park playgrounds offer a wide variety of playing equipment. The playgrounds are located all over the park, so no matter where you are staying you can take your kids out to play. One of the biggest playgrounds is located at the south end of the Park near the Wollman Rink and the Time Warner Center where you can stop for an inexpensive lunch at Whole Foods, a giant store in the basement of the building. The Central Park Zoo is a favorite with young visitors who come there to watch polar bears, monkeys, penguins and sea lions. A separate petting zoo lets kids get to know tame animals from up close. Be sure not to miss the famous Balto statue which is situated on the path leading north from the Zoo. Central Park Zoo is a wildlife oasis in the middle of one of the busiest cities in the world. Located in New York City's Central Park at 64th Street and Fifth Avenue, the zoo features two separate areas: the wildlife center and the petting zoo particularly popular with children. Visitors can view sea lions, penguins, polar bears, tropical birds and rare monkeys. One of the most visited events are sea lion feedings which take place in the Central Garden several times per day. The zoo presents tropic, temperate, and polar habitats, featuring more than 1,400 animals and over 130 different species. Visit the Polar Circle part of the zoo to observe penguins dive into their pool of water. Watch the polar bear through a thick window of plexiglass swim underwater. The Leaping Frog Cafe serves snacks and offers outdoor seating during the warmer months. Admission is $6.00 for adults, $1.25 for seniors 65 and older, $1.00 for kids 3-12, and free for children under 3. The Central Park Zoo is open Monday through Friday 10 am to 5 pm, weekends from 10 am to 5:30 pm from April to October; and daily from 10 am to 4:30 pm from November through March. For more information, call 212-439-6500. On your way to and fronm the Zoo, children like to look at the statue of Balto, located in Central Park at East Drive and 67th Street, is a favorite with kids. Situated on the path leading north from the Central Park Zoo, the bronze statue is perched on top of a rock. Children know Balto from a 1995 animated film about an Alaskan malamute who traveled 660 miles to deliver an antitoxin needed to halt a diphtheria epidemic through an Alaskan blizzard. The animated film is based on a true story. Balto even came to New York City when his statue was dedicated in 1925 near Willowdell Arch. The bronze statue is slightly larger than life and shows Balto panting with his legs braced, dogsled harness hanging from his back, while he gazes into the distance. There are other statues in the park. Nearby, you will find the historic The Central Park Carousel and several playgrounds. Further up north in Central Park are Conservatory Water, the Arthur Ross Pinetum, The Ramble and the Swedish Cottage Marionette Theater which is close to the American Museum of Natural History. There are several great hotels in the area, including the Plaza Hotel, the Mandarin Oriental, New York and The Ritz-Carlton New York, Central Park. The Central Park Carousel, located Central Park at 64th Street, is a popular stop for young New York visitors, attracting 250,000 riders every year. The vintage carousel features 58 hand-carved painted horses and is one of the largest in the United States. The horses are nearly life-size in the outer ring and can accommodate adults as well as children. There are four horses in each row, beginning with two larger ones on the outside and two child-sized horses in the inside. The horsesy move up and down as the carousel goes around in a circle. Those who do not like to ride on horses can ride in two comfortable carriages. The first carousel in the park was built in 1870s, powered by animals. A steam-powered carousel arrived at the turn of the century, replacing the original. The present structure is the fourth one and has been in the park since 1951. Each ride costs $1.25. The Carousel is open daily from April to November, 10 am - 6 pm, weather permitting. During the colder months, from November to April, the Carousel is open on weekends, 10 am - 4:30 pm, weather permitting. For more information, call 212-879-0244. Swedish Cottage Marionette Theater in New York City houses a small children's theater and design workshops. Located in Central Park at West Side and 79th Street, the cottage features Scandinavian details inside the theater which seats 100 children. This is the only public marionette theater company left in the US. It writes and produces their own shows and designs its own costumes for the puppets. Some of the productions have included Cinderella, Jack and the Beanstalk, and Hansel and Gretel. The cottage was placed in the park in 1876. It was originally a schoolhouse sponsored by the Swedish government for the 1876 Centennial Exposition in Philadelphia. The best way to reach it is to follow the path from the Central Park entrance near the American Museum of Natural History on the Upper West Side. For current performance information, call 212-988-9093. Admission is $5 for children, $6 for adults, and $4.50 for schools or not for profit groups. Reservations are required. Shakespeare Garden, located at West Side and 79th Street, between the Delacorte Theater, Belvedere Castle, and the Swedish Cottage, was dedicated to Shakespeare in 1916, the 300th anniversary of his death. This romantic garden features flowers from Shakespeare's plays, trees, and rustic benches. Visitors often bring a book and read in this quiet area. Flowers bloom throughout the seasons and are especially lovely in the spring. The garden reaches to the top of Vista Rock and Belvedere Castle from which one can enjoy beautiful views of the Park and the city. Nearby attractions include the Strawberry Fields, The Ramble, the American Museum of Natural History and the Arthur Ross Pinetum. New York City's Central Park has 21 playgrounds for kids, scattered throughout the park. Some are large, featuring state-of-the-art play equipment, while others are small and less visited. Most open every day at 7:30 am and close at dusk. The Heckscher Playground is the largest in the Park, spanning over three acres. Situated between 61st and 63rd streets, at Seventh Avenue and Central Park South, the playground is for kids ages 6 to 12. It features 14 swings, seesaws, a water feature, a wooden suspension bridge, and its own restroom facilities. The Billy Johnson, just north of the Central Park Zoo at East 67th Street, is known for its beautiful landscaping, swings and tables for picnic. All equipment here is constructed of white cedar and can be used by children of all ages. Near the Metropolitan Museum of Art, the Ancient Playground derives its name from the Egyptian Wing of the museum. The playground features wooden play equipment for older children, as well as bucket swings and a separate sandbox area for smaller children. Pat Hoffman Friedman Playground, also near the Metropolitan, is a small playground for children two to five years old. It features the cute Group of Bears sculptures, a small fountain, bucket swings, a sandbox, an adventure slide, and monkey bars. The Safari Playground at West 91st Street, for kids ages two to five, features a jungle theme with 13 hippopotamuses, a canoe float in a pool, treehouses, picnic tables, and a tot-sized jogging path mirroring the nearby Reservoir running track. Robert Bendheim Playground at East 100th Street for ages 2 to 5 is the only playground that accommodates disabled children. The West 100th Street Playground for children of all ages is one of the oldest. It features painted wood equipment stands in sand-covered area, monkey bars, tire swings, two tree houses, a roller slide, pyramid slide, a wooden bridge, a star-shaped fountain, and a sprinkler. Mother Goose Statue: The granite Mother Goose statue is located at East 71st Streetk. A fun sculpture for kids, Mother Goose by Frederick George Richard Roth was placed here in 1938 after it was donated by the City of New York. The granite statue is located at East 71st Street. Mother Goose is shown flying on her oversized goose against the wind. The sculpture includes other characters: Humpty Dumpty, Little Jack Horner and Little Bo Peep. The Falconer: The Falconer is a bronze statue located at mid-Park on south side of the 72nd Street Drive. The statue shows a human figure holding a falcon high up in the air. The falcon is depicted with its wings spread wide apart. The Falconer was created by George Blackall Simonds in 1875. There are several other statues located nearby. Mother Goose Statue is located at East 71st Street, Balto at East Drive and 67th Street, and Alice in Wonderland at 74th Street near Fifth Avenue. Wollman Skating Rink: At the Wollman Rink, you can rent skates and glide on the ice surrounded by the city skyline and upbeat music. The atmosphere is especially romantic at night and during the winter holiday season. Go skating at the Wollman Rink and admire awesome NY skyline views. For more information about the Wollman Rink hours and fees, call 212-439-6900. If you need more information, the Visitor Information Center is situated just to the north of the rink. You can pick up a list of current Park events, or purchase a guidebook in the Gift Shop. The Visitor Center in the Dairy: The Visitor Center is housed in the Dairy, a 19th century Swiss chalet with Gothic touches. The visitor center, open from 10 am to 5 pm Tuesday through Sunday, features a permanent exhibit about the history of Central Park, and a gift shop. From the Dairy loggia, visitors can see the Wollman Rink and the city skyline. You can also pick up a list of current Park events and programs, including free concerts in the summer and various programs for kids. Nearby attractions include the Zoo, the Carousel, and the statue of Balto. Alice in Wonderland Statue in Central Park: Alice in Wonderland is the children's favorite sculpture in Central Park in New York City. Kids climb on it, touch it to experience different textures, and interact with the characters. Located at the northern end of Conservatory Water, the statue features characters from Lewis Carroll's 1865 classic tale Alice's Adventures in Wonderland. The sculpture, dedicated in 1959, was commissioned by philanthropist George Delacorte from Jose de Creeft. Alice is seated on a giant mushroom, while March Hare and Mad Hatter flank the sculpture on both sides. The timid mouse is perched on top of a smaller mushroom, while the Cheshire cat looks over her shoulder. The Statue of Hans Christian Andersen: The statue of Hans Christian Andersen is located near Alice, west of Conservatory Water, at 74th Street near Fifth Avenue. The sculpture was designed to be climbed on, which makes it popular with kids. The statue includes a duck gazing up at Hans Christian Andersen who is holding an open book with opening lines of The Ugly Duckling. In the summer months, visitors gather around the statue for storytelling, featuring famous fairy tales, such as The Ugly Duckling, The Little Mermaid and The Emperor's New Clothes. Conservatory Water or "The Model Boat Pond": Conservatory Water is also known as the model boat pond located in Central Park at 74th Street near Fifth Avenue in New York. Inspired by model boat ponds of Paris, Radio-powered model boat races take place between members of the Model Yacht Club. Visitors can rent their own miniature boats from a nearby concessionaire's wagon. Bird watchers often meet at the pond with telescopes and binoculars to watch for red-tailed hawks who nest on a Fifth Avenue apartment ledge. In the winter, children enjoy sledding on Pilgrim Hill which surrounds the attraction. You should also not miss two famous statues - Alice in Wonderland and the statue of Hans Christian Andersen. Kerbs Boathouse a features a terrace cafe open for light snacks, and restrooms. In the spring, flower beds in front of the boathouse are planted with beautiful tulips of various colors. The garden is well maintained by volunteers year-round. During the warmer months, the pond is filled with water and used for model boats. Rent a Boat at The Boathouse: Rent a boat on your romantic weekend getaway to New York and enjoy unique views from the water. The Boathouse, located on the East Side between 74th and 75th streets, offers boat rentals, gondola rides, bicycle rentals and dining. Inside the Boathouse, birders can record their observations of birds and other wildlife in a notebook. The first Boathouse was designed in the 1870s at the eastern end of the Lake. The current Loeb Boathouse took its place in 1950s after the original structure burnt down. Dining is offered year-round at the restaurant overlooking the lake, so you can have a romantic lunch with a view right after. The deck features overhead heating so that outdoor dining services can be extended into the fall. For reservations, call 212-517-2233. Snacks are offered on the outside terrace facing the bicycle rental concession. Row boats are available for rent daily from March through October, weather permitting, from 10:00 am to 5 pm. The cost for the rental is $10 for the first hour and $2.50 each additional 15 minutes. A $30 cash deposit is required. Romantic gondola rides, offered in the summer, cost $30 per half hour. The hours are 5:00 pm to 9:00 pm Monday through Friday, and 2:00 pm to 9:00 pm Saturday and Sunday. Bicycle rentals cost $9 to $15 per hour. A credit card, driver's license or passport are required as a deposit. Turtle Pond and Belvedere Castle: Even though not a part of the original Central Park design, Turtle Pond beautifully complements Belvedere Castle and the Great Lawn. Situated at mid-Park between 79th and 80th Streets, the area is home to fish, frogs, turtles, dragonflies and various species of birds. The pond was completely renovated in 1997 with new features such as shoreline plants which provide a natural habitat for birds, insects, amphibians, and reptiles. Turtle Island, also added during the renovation, serves as a wildlife habitat where turtles lay their eggs and birds build their nests. Visitors can borrow a naturalist's kit from the nearby Belvedere Castle and observe the wildlife. The castle offers some of the best views of the Park, including the Delacorte Theater, Great Lawn and the city skyline. It is located at mid-Park at 79th Street and is open Tuesday through Sunday from 10 am to 5 pm. Designed by Frederick Law Olmsted and Calvert Vaux, the Castle was meant to be a fantasy building with open window frames and doorways. It is home to the Henry Luce Nature Observatory, run by the Central Park Conservancy, which features telescopes, microscopes and other tools used by naturalists. Kids will enjoy reproductions of birds that can be found on the second floor. Visitors can borrow equipment that will help them explore the park - binoculars, reference material and maps. For more information, call 212-772-0210. Arthur Ross Pinetum at West 85th Street: A walk in the Arthur Ross Pinetum in Central Park at West 85th Street is always a surprise because of the wonderful scent of pine which surrounds the visitor as they walk among the trees. This collection of pine trees features 14 different species and more than 450 magnificent trees. The trees are situated at the northwestern corner of the Great Lawn. This area of the park features several playgrounds for kids, including the Ross Pinetum Playground for children of all ages. The large picnic area surrounded by pine trees is a perfect spot for a family picnic in the summer. In the winter, birdwatchers often spot migrating long-eared and saw-whet owls sleeping in the pine trees during the day. The Great Lawn, stretching from 79th to 85th street in the middle of the park, is the largest open space and the site of numerous events, especially in the summer. The Philharmonic and the Metropolitan Opera each present two free performances on the newly-restored Great Lawn in the summer. Visitors enjoy music performances surrounded by fresh green grass and outlines of city skyscrapers. You can get the schedule from the offices in Lincoln Center. During the day, people play or watch a game of softball, soccer, basketball, or volleyball. At the south end of the Great Lawn, you will find the Delacorte Theater with its famous statue of Romeo and Juliet. Heckscher Ballfields: Heckscher Ballfields, located at 63rd Street between the west and center drives, offer six ballfields where teams and other groups can reserve to play baseball or softball from mid-April through mid-September. In order to play at Heckscher Ballfields, groups must apply for a permit. Permits are issued by NYC Department of Parks and Recreation and cost $8 per session. Permits are free for a league composed of players 17 years old and younger. One can request a permit by phone at 212-408-0209. Check into one of these stylish hotels with the family. Have fun with colorful storybook characters, explore Central Park with kids, visit the zoo and spend an afternoon on one of the unique playgrounds in the park. Many hotels offer vacation packages and deals for families. Here are some of our favorites. Children's Packages at the Plaza: The Plaza offers several packages for children. Even if you are not staying at the hotel, you can take your daughter to the famous Eloise shop. Family at Hotel Plaza Athenee: Designed for families with kids under 15 years old, the "Classic Families Package" at Hotel Plaza Athenee offers the following two rooms (connecting) or a two-bedroom suite, breakfast, gift bag for kids, tickets to the zoo and other amenities. Rates start from $1,120. Sophie at the Carlyle: The Carlyle is offering the Sophie Package for kids which includes: a designer dress, necklace, suite, signed book, pillow and a loaner iPad Mini to follow a virtual tour through the city. From $835 for the first night (For additional children, add $450 per child). 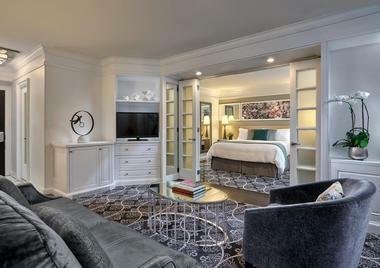 Family at Le Parker Meridien: Le Parker Meridien is offering a family special from $350 which includes: junior suite (sleeps a family of 4), haircuts, access to the renovated pool. 20% Off Suites at The Mark: The Preferred Suites deal at The Mark gives you 20% off their best available rate.